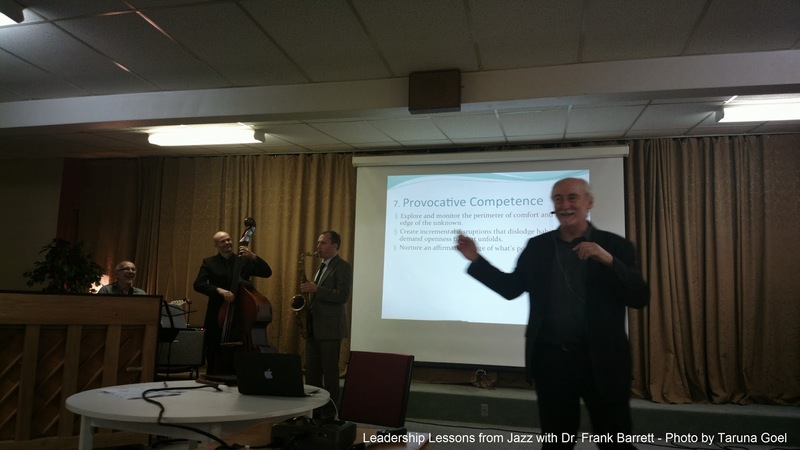 In October, I attended a fascinating session by Dr. Frank Barrett, jazz pianist and author of Yes to the Mess: Surprising Leadership Lessons from Jazz. 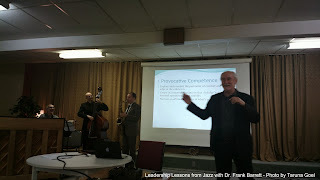 The session was jointly organized by ISPI Vancouver with ICF Vancouver, CAPS, CRG International and coordinated by Brian Fraser, the lead provocateur of Jazzthink. Dr. Barrett is an accomplished, long-time pianist and is currently a professor of management at the Naval Postgraduate School in Monterey, California. Against the backdrop of jazz, Dr. Barrett shared what Duke Ellington and Miles Davis can teach us about leadership and management. 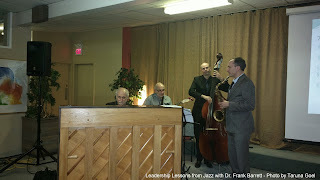 Using jazz as a metaphor for learning was a brilliant concept. I had so much to learn about learning and... about jazz. To demonstrate the principles of creativity and improvisation in jazz, he performed with three jazz artists from the Jazzthink Trio who he had met for the first time in the room! The artists had never performed with Dr. Barrett before. Without knowing each other, just by applying the principles Dr. Barrett spoke of, the jazz band enthralled the audience with amazing jazz improv. It was entertaining and very insightful. I almost forgot that I was attending a leadership training session! We all certainly 'hit the groove' in this session! In his book, Yes to the Mess: Surprising Leadership Lessons from Jazz, the 'Mess' refers to constant change and unstructured tasks we need to perform on a daily basis. Saying 'Yes' to the 'mess' means to develop an improvisational mindset, which means to leap in and take action. But saying yes is not about problem-solving, it is about improvising with what you have and believing that something new and creative will emerge. In that sense, if a leader says 'yes to the mess', it encourages everyone to take risks and perhaps create something amazing together! 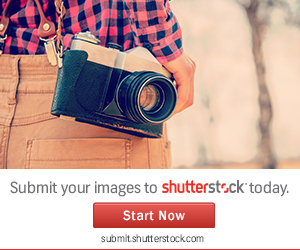 You will enjoy reading one of his older manuscripts that discusses some of the concepts here. 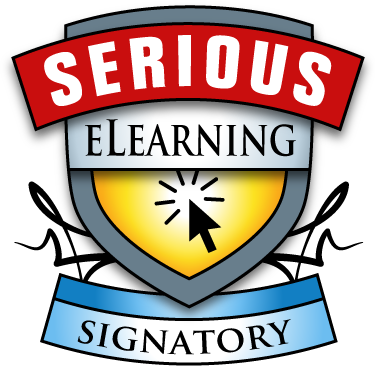 Here is an interesting article by Dr. Barrett titled, 'If Miles Davis taught your office to improvise'. Here's an interview (with transcript) as a part of the HBR IdeaCast series from Harvard Business Review. Lots of good stuff here. Another podcast that discusses some more personal examples from his career and how jazz helped him become a better Professor of Management by throwing away his teaching plan and developing a more improvisational, creative teaching style. Here's a blog by Ewan McIntosh that discusses Dr. Barrett's principles and shares similar leadership lessons that have been summed up beautifully by other musicians.